Colder-than-average temperatures in the Antarctic stratosphere created ideal conditions for destroying ozone this year, but declining levels of ozone-depleting chemicals prevented the hole from as being as large as it would have been 20 years ago. "Chlorine levels in the Antarctic stratosphere have fallen about 11 percent from the peak year in 2000," said Paul A. Newman, chief scientist for Earth Sciences at NASA's Goddard Space Flight Center in Greenbelt, Maryland. "This year's colder temperatures would have given us a much larger ozone hole if chlorine was still at levels we saw back in the year 2000." According to NASA, the annual ozone hole reached an average area coverage of 8.83 million square miles (22.9 square kilometers) in 2018, almost three times the size of the contiguous United States. It ranks 13th largest out of 40 years of NASA satellite observations. Nations of the world began phasing out the use of ozone-depleting substances in 1987 under an international treaty known as the Montreal Protocol. The 2018 ozone hole was strongly influenced by a stable and cold Antarctic vortex—the stratospheric low pressure system that flows clockwise in the atmosphere above Antarctica. These colder conditions—among the coldest since 1979—helped support formation of more polar stratospheric clouds, whose cloud particles activate ozone-destroying forms of chlorine and bromine compounds. In 2016 and 2017, warmer temperatures in September limited the formation of polar stratospheric clouds and slowed the ozone hole's growth. In 2017, the ozone hole reached a size of 7.6 million square miles (19.7 square kilometers) before starting to recover. In 2016, the hole grew to 8 million square miles (20.7 square kilometers). However, the current ozone hole area is still large compared to the 1980s, when the depletion of the ozone layer above Antarctica was first detected. Atmospheric levels of man-made ozone-depleting substances increased up to the year 2000. Since then, they have slowly declined but remain high enough to produce significant ozone loss. NOAA scientists said colder temperatures in 2018 allowed for near-complete elimination of ozone in a deep, 3.1-mile (5-kilometer) layer over the South Pole. This layer is where the active chemical depletion of ozone occurs on polar stratospheric clouds. The amount of ozone over the South Pole reached a minimum of 104 Dobson units on Oct. 12—making it the 12th lowest year out of 33 years of NOAA ozonesonde measurements at the South Pole, according to NOAA scientist Bryan Johnson. "Even with this year's optimum conditions, ozone loss was less severe in the upper altitude layers, which is what we would expect given the declining chlorine concentrations we're seeing in the stratosphere," Johnson said. A Dobson unit is the standard measurement for the total amount of ozone in the atmosphere above a point on Earth's surface, and it represents the number of ozone molecules required to create a layer of pure ozone 0.01 millimeters thick at a temperature of 32 degrees Fahrenheit (0 degrees Celsius) at an atmospheric pressure equivalent to Earth's surface. A value of 104 Dobson units would be a layer that is 1.04 millimeters thick at the surface, less than the thickness of a dime. 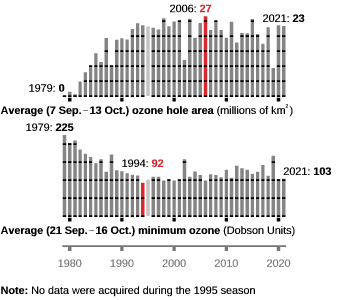 Prior to the emergence of the Antarctic ozone hole in the 1970s, the average amount of ozone above the South Pole in September and October ranged from 250 to 350 Dobson units. What is ozone and why does it matter? Ozone comprises three oxygen atoms and is highly reactive with other chemicals. In the stratosphere, roughly 7 to 25 miles (about 11 to 40 kilometers) above Earth's surface, a layer of ozone acts like sunscreen, shielding the planet from ultraviolet radiation that can cause skin cancer and cataracts, suppress immune systems and damage plants. Ozone can also be created by photochemical reactions between the Sun and pollution from vehicle emissions and other sources, forming harmful smog in the lower atmosphere. NASA and NOAA use three complementary instrumental methods to monitor the growth and breakup of the ozone hole each year. Satellite instruments like the Ozone Monitoring Instrument on NASA's Aura satellite and the Ozone Mapping Profiler Suite on the NASA-NOAA Suomi National Polar-orbiting Partnership satellite measure ozone across large areas from space. The Aura satellite's Microwave Limb Sounder also measures certain chlorine-containing gases, providing estimates of total chlorine levels. The total amount of ozone in the atmosphere is exceedingly small. All of the ozone in a column of the atmosphere extending from the ground to space would be 300 Dobson units, approximately the thickness of two pennies stacked one on top of the other. 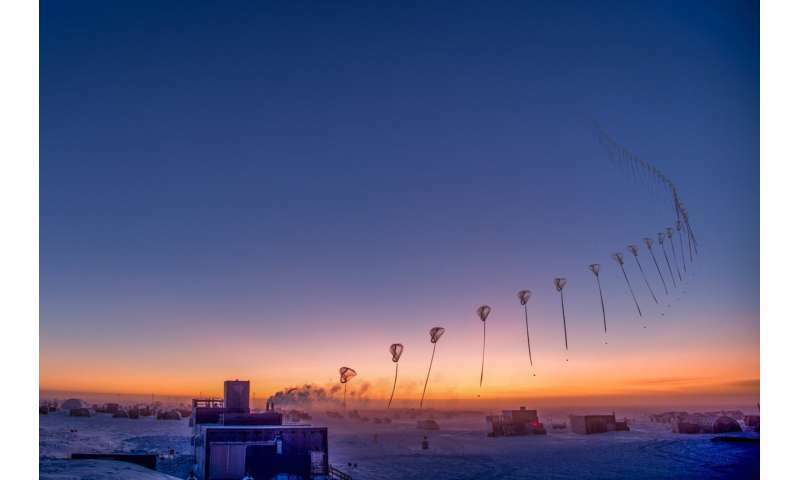 NOAA scientists monitor the thickness of the ozone layer and its vertical distribution above the South Pole by regularly releasing weather balloons carrying ozone-measuring "sondes" up to 21 miles (~34 kilometers) in altitude, and with a ground-based instrument called a Dobson spectrophotometer. a layer of ozone acts like sunscreen, shielding the planet from ultraviolet radiation that can cause skin cancer and cataracts, suppress immune systems and damage plants. All of which affects no one. No one's sunbathing or playing volleyball in shorts on the balmy shores of Antarctica and getting skin cancer. After 1987, the maximum ozone hole sized essentially stopped growing, 8 years before global chlorines started to decrease. To the rational mind, this suggests that the effect of CFCs on the ozone hole is overblown. Oh achybreaky, the only overblown are you paid denier shills huffing and puffing to blow down the house of bricks Science has built!